Rock Shox Judy 100 TT Mountain Bike Fork Black. Condition is Used. Shipped with USPS Priority Mail. Steerer length: 6.75 in. Threads steerer: 2 in. Steerer O.d: 1 1/8 approx. Steerer I.d: 25.4mm. Nothing that will affect performance of this gorgeous fork. Tire well : 73 mm approx. This is a nice Rock Shox Mag 21 with blue AC (adventure components) brace. Needs rebuilt from what I can tell but did not add air. 1 1/8" Threaded. 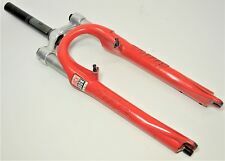 For 26" Mountain Bike. Steer tube, 6" long. 1 1/8" Threadless. For 26" Mountain Bike. Steer tube, 6" long. Fits any 26" boxxers with 35" legs. RockShox Judy T2 Vintage Fork Canti V brake 1 1/8" Threadless 216MM MTB Charity! Rock Shox Duke XC with disc brake bosses, cantilever bosses, 75 mm travel. 175 mm 1 1/8" threadless steerer tube. We carry a wide variety of authentic, classic, antique and near extinct parts to popular components and accessories. Rock Shox Lyrik RC2 DH. 190mm Tapered Steerer. 170mm Travel. Air, Compression, Rebound Adjustable. 20mm x 110mm Axle. RockShox Recon Silver TK Fork Solo Air 26" 100mm MTB With Oneloc Remote 1-1/8"
Condition is used. Appears to function as it should. The Rockshox Pike is back for another year! From trail shredding to rock garden bombing, the Pike has your back. With an all new damper that rides high in the travel where it�s like riding a cadillac. The asymmetric chassis design offers exceptional stiffness to travel to weight ratio, that will leave you wanting more. Treat your self to high-class performance with Rockshox's Pike. Air Guides - starting pressures noted on the back of the fork help you set up your suspension in seconds instead of minutes Charger Damper - Extruded bladder design is insanely durable, resists damping change during extended downhills and has virtually zero pressure offset for small bump sensitivity Crown adjust External rebound, low speed compression, 3-position. Savvy trail riders run the Sektor. Steerer Tube Length 265. Steerer Type Straight. Front Axle 15mm Thru x 100mm. Positive Spring Coil. Negative Spring Coil. Wheel Size 26. Solo Air lets you add air to your forks through a single Schrader valve, filling both the positive and negative air spring chambers simultaneously. Collectable fork. Does not neer to be sold. Has once been tuned by Tim Folks (TF tuning). Rockshox Judy XC Suspension Fork Vintage 26" Cantilever 1 1/8" MTB Trek Charity! Vintage Rock Shox Indy XC Fork Canti V Brake 1 1/8" 190mm Klein Trek GT Charity! 26" Wheel, 65mm fork blade clearance. We are a non-profit collective (Madison Freewheel Bicycle Cooperative) in Madison, WI. A portion of the profits from every item supports charitable bicycle programs. Boxxer revive Kit - Part Number 110-004977-00. Believed to Fit 1998-2001 Model years with 28mm Stanchions. 2 white plastic bushings. While there may not be any podiums out on the trail, there’s no denying the ultra light weight, stiffness and damping technologies of our World Cup level forks will give you the competitive edge against the locals at your trail. RockShox Pike RCT3 Suspension Fork 26'' Solo Air 160mm 1-1/8''-1.5'' Axle: 15x10. If you live for the downhill, the Lyrik is for you. With 170mm of travel, this plus fork comes alive when the going gets rough. The fork is outfitted with RockShox's fluid Mission Control DH damping that boosts oil flow to smooth out big hits and provide consistent damping the start to end of the trail. It also lets you perfectly tune the fork to trail conditions. From butterfly inducing drops to naildriver bumps, the Lyrik dampens vibrations and absorbs shock, for a buttery smooth ride all day. Solo Air is like a Buddhist monk. Its enlightened design lets you add air to your forks through a single Schrader valve, filling both the positive and negative air spring chambers simultaneously. So they're always in perfect equilibrium, like Yin and Yang. Giving you a plush,. Spring: Solo Air Damper: Motion Control IS Manufactured year: 2018 Bike Type: DH Wheel Size: 26 Crown: Forged 6061 T-6 aluminum, direct mount stem compatible Axle to crown: 22. The Sektor is a perfect example of trickle down technology with a chassis of the Revelation and with the value of a capable trail fork. MPN: 00.4018.641.003 - RockShox - Sektor Gold RL Suspension Fork - Suspension Fork. RockShox Boxxer RC Suspension Fork 26'' Coil 200mm 1-1/8'' Axle: 20x110mm TA Off. RockShox Sektor Gold RL Fork 26" 150mm, Dual Position Coil, MoCo Maxle15, 1-1/8"
Savvy trail riders run the Sektor. Solo Air lets you add air to your forks through a single Schrader valve, filling both the positive and negative air spring chambers simultaneously. Crown Race 30. Positive Spring Coil. 5 out of 5 stars - RockShox Sektor Gold RL Fork 26" 150mm, Dual Position Coil, MoCo Maxle15, 1-1/8"
3 product ratings3 product ratings - RockShox Sektor Gold RL Fork 26" 150mm, Dual Position Coil, MoCo Maxle15, 1-1/8"
Savvy trail riders run the Sektor. It rewards you with the same damper performance and chassis structure as the exotic race products, only without the exotic materials or price. So while you’ll pay a slight weight penalty, you’ll still be able to pay for a few pints after your ride. 2.4" maximum tire width Solo Air lets you add air to your forks through a single Schrader valve, filling both the positive and negative air spring chambers simultaneously Forged, hollow 6061 T-6 aluminum crown 32mm aluminum upper tubes Color: Gloss Black Weight: 2082 Offset: 40 Axle to Crown Length: 529 Crown Race: 30 Steerer Tube Length: 265 Brake Type : Post Mount. RockShox Boxxer Team 2010 Fork OUTSIDE USA SALE ONLY! MINT COND WITH 5 RIDES!! Only thing will be different is it would be a SPRING in an open oil bath over an AIR spring which a lot of people aren't crazy about due to them ramping up quick. I prefer spring as it's smoother travel and plusher. Savvy trail riders run the Sektor. It rewards you with the same damper performance and chassis structure as the exotic race products, only without the exotic materials or price. So while youƒ? ?ll pay a slight weight penalty, youƒ? ?ll still be able to pay for a few pints after your ride. Up for sale is one new Genuine Rock Shox Reba / SID 100mm Air Shaft - 26" - Part # 11.4018.021.007. Rockshox Boxxer WC. It functions but I would imagine due to it's age it needs a service. The Sektor remains the clear choice for real-world trail bikes and real-world riders. Includes shock pump. Weight: 2082 g, based on 265mm 1-1/8" steerer, Maxlelite 15. Rock Shox USA Judy T2 Fork Vintage RARE 1350g! Like new Rock Shox Judy T2 Fork. Themileage only about 100-150 miles (200km). You can use V brakes or discs brakes. No springs or dampers. Good condition with no cracks.